XBRL (eXtensible Business Reporting Language) started life as a dream of freeing information from the tyranny of the logical cave wall, also known as the printed page or computer screen. Now we discover that the information is going to be read by humans after all, so lets make a logical cave wall version of XBRL. Um, isn't this where we started from, and if so, why not just stick with something simple like, oh, XML, CSV, PDF, Word, or even a web-based form? Because iXBRL will merge the benefits of the logical cave wall while also freeing the information. Once upon a time there was a cave wall. Someone drew a picture on that wall. The picture said “There are deer here, cows there, other people (competitors) over there”. So business reporting began. Then humans discovered mud (well, at least for "writing"), and suddenly we could make business reports on mud tablets, dry them in the sun or fire them, and store them in our library. Much of what we have learned about Ur, Ebla and other ancient cities has come from their mud libraries, which were preserved when the libraries were burned, either accidentally or as the result of conflict and invasion. 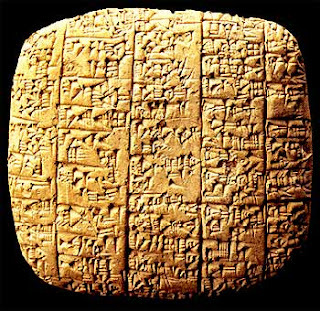 In the case of Ebla, more than 15,000 cuneiform tablets were preserved when the library was burned. These tablets include some of the earliest references to biblical figures and places, provides us with names of cities yet to be discovered, and histories and relationships long lost. Just read this, it’s fascinating. Okay, I admit I cannot read it either, but if you look very closely, you can probably see the "angle brackets". But lets move quickly forward in time - past papyrus, velum, then paper, and finally, to the computer screen and the high volume printer. Suddenly we have the opportunity to decouple each word, each concept, from the cave wall, or the mud tablet, or even the printed page. Fantastic, if words and concepts are no longer tied to the page (or logical cave wall) then we can have the computer create the words - we'll start calling it 'data' here - and pass that data to other computers to read and use on our behalf. Enter XBRL, and the crowd goes wild! For too long have we manually entered or computationally created data, printed that data, and then re-keyed or recreated that data in another system, putting human error right in the middle of our carefully conceived plans. With XBRL, we can truly make the human interface redundant. We can create the data in any system we want to, provide that data to "the world" or any subset of “the world” we want to, and have the receiver automatically consume that data into their computer, producing content for decision making - wait for it - printed reports for humans to read. Printed in this context of course meaning anything from a cave wall to a computer screen to an actual printed piece of paper. And here is the most important point, XBRL is data. It is data decoupled from the tyranny of the cave wall, freed from human error, and severed from the need for the human eye to provide the final quality control or audit check of the data. Okay, so we've made the great move. We are now data-centric. The cave wall is done, history, finished - efficiency is in front of us all the way. So, just to remind you, you are sitting in front of your logical cave wall right now, reading what I've painted on that wall. Okay, I admit it, I can’t really read this either. Good isn't it. All that data. All that meaning, from computer to computer. We've cut out the person. No errors, fast, but with one small problem; people cannot read data. And in the end, if it does not pass the eyeballs test (actually, the brain behind the eyeballs, but lets not be picky), how can we give assurance that all that data is really what we thought it should be. Because assurance, whether by the creator of the data or by an external party, is based on human eyeballs looking at the information and interpreting that information through analysis and comparison with what the reading eyeballs think the information should be. The answer - "readable" data, also known as "Inline XBRL" or iXBRL. The idea is to create a standard that allows XBRL data to be imbedded into an HTML stream such that the HTML page can be displayed with the XBRL data. 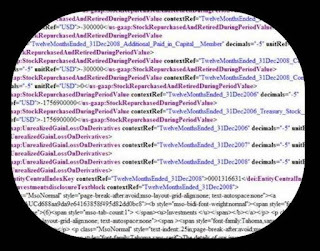 The XBRL data can then be extracted by the receiving computer(s) and the HTML stripped, leaving the XBRL ready to be stripped of the XBRL and imported into the receiving system. Being able to actually see (understandably) what is in an XBRL instance document is important. We use to assume that the software vendors would fill the gap with tools for easy viewing, and in particular that Microsoft would actually build XBRL into its product suite. Maybe they have and will. But the software vendors simply have not stepped up to the plate adequately to enable ubiquitous and simple viewing of XBRL. So consumers of XBRL, in particular HMRC (HM Revenue and Customs) in the UK have decided that Human Readable XBRL (iXBRL) is what must be provided, not XBRL. In order to enable this, the "Inline XBRL" specification has recently been approved. Which brings us right back to the cave call, or the cuneiform tablet. Humans needs to see, with their eyes, the information that is being provided. XBRL is the answer for computer created for computer consumed information, provided there remains the ability to paint a picture on the cave wall. iXBRL provides XBRL's logical cave wall. But does that then undermine vendors efforts to actually create XBRL viewer software. I don't think so. Vendors will build applications to meet business needs, and the ability create a logical cave wall version of the information contained in XBRL instance document will not go away. In addition, iXBRL does at least provide a recognition that the logical cave wall remains a critical part of the business reporting environment. Will iXBRL help expand the range of use-cases for XBRL? Quite possibly, by providing the logical cave wall integrating separable, non-human consumption of the data. Our cave wall (i.e. blog) will soon respond to this post in detail but in the meantime check out our caveLink below that automatically draws pictures for you - without a chisel! Nice. Is this in the SEC viewer, or did I see this before in a Rivet demo? Rivet has developed two interactive data viewers for the SEC's VFP (found at http://www.viewerprototype1.com & http://a.viewerprototype1.com). We have also developed the "rendering engine" behind the SEC's current previewer and interactive data viewer. CrossView is our own implementation of the interactive data viewer, which includes some additional features, such as charting and highlighting the extended elements used by filing companies. While it is not iXBRL, it goes a long way towards transparency and comparability. All of these viewers feature the ability to click on the row label and get references and definitions for the data. With regards to iXBRL, please look forward to the upcoming release of Crossfire. We have worked closely with organizations in UK and US to create integrated, user-centric solutions for supporting iXBRL. If I may, for further reading I'd like to recommend Andy Greener's post on Inline XBRL for the Hitachi XBRL blog (http://tinyurl.com/daakhs).